Gerard Depardieu — The beloved actor of audience, aesthetic and gourmet, restaurateur and winemaker — personality is multifaceted and unpredictable. 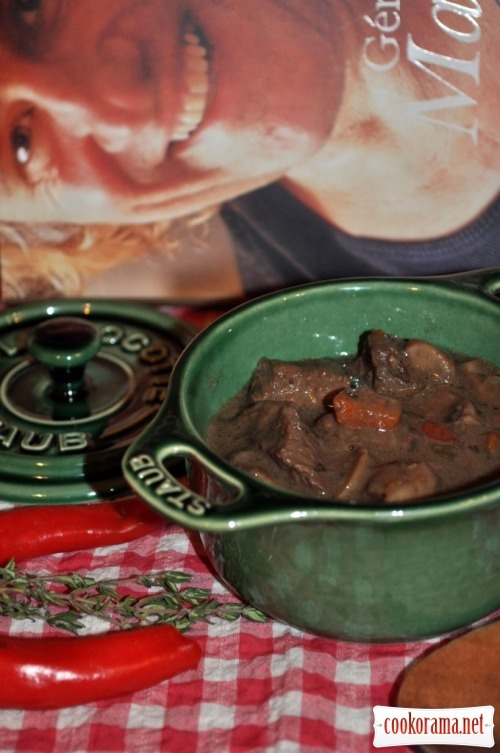 Gerard Depardieu, as a true French cook, can cook gourmet meal from simple food. I have his book «My kitchen» — Gérard Depardieu «Ma Cuisine» — where he shares with readers simple recipes. In fact, I would not call them simple recipes — from word simply that is easy to prepare. But the truth is that recipes are delicious. Some products are recommended by Depardieu, for most of people are inaccessible because of their absence, but it is the usual replacement for you. This recipe from this book. Despite the fact that much is written — is very easy. Peel and finely chop shallots and carrot. 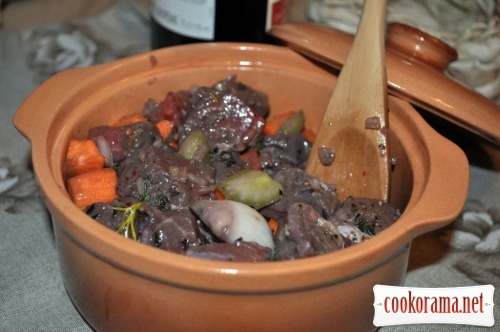 Cut meat into large cubes, put everything in a clay form, pour wine, oil, add onion, carrots and shallots, bouquet garni and coarsely ground pepper, stir with a wooden spoon, close the form and marinate at least 12 hours. 2. The next day get the meat out of the marinade, dry it with paper towels and drain the marinade properly. 3. Warm oil with 30 g of butter in a frying pan and fry meat, and when it is browned on all sides, drain excess fat from the pan. In a pan melt the remaining 20 g butter, add strained meat juice, remaining in a saucepan, add flour, lightly fry it. You will get filling. Bring strained marinade to a boil in saucepan, add filling, stir and add to the pan with meat, salt and pepper, cover and simmer over low heat for half an hour. 4. Peel and finely chop mushrooms, white onions and cut bacon into small cubes. 5. In 15 minutes before the end of stewing melt the bacon in a pan, add onions and mushrooms, cook for 15 min., Then add mixture to the meat and simmer everything together for about 10 minutes. Check readiness of meat piercing it with fork — it should be soft. Otherwise, hold it on fire for a few minutes. For garnish serve small potatoes, lightly boiled and brought to full readiness in the oven. Or just boil new potatoes — by season. Boil potatoes, drain water, mash potatoes, add butter, stir, sprinkle chopped parsley. I`m sure, you`ll like this meat! We liked it very much. 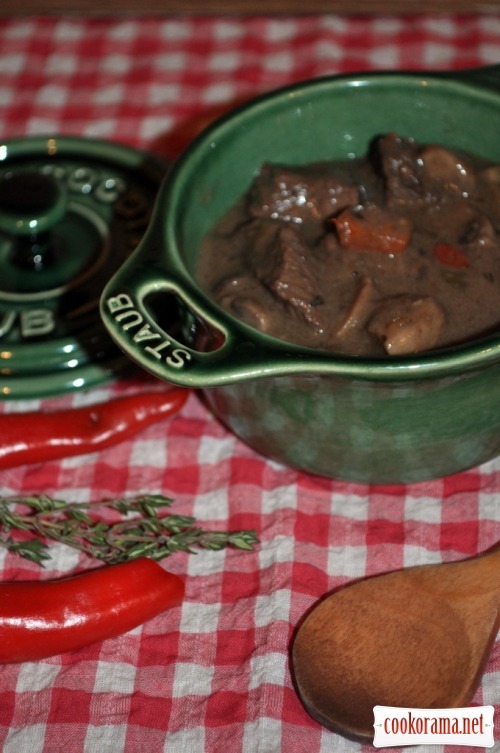 Top of recipe "Burgundy Beef by Gerard Depardieu"